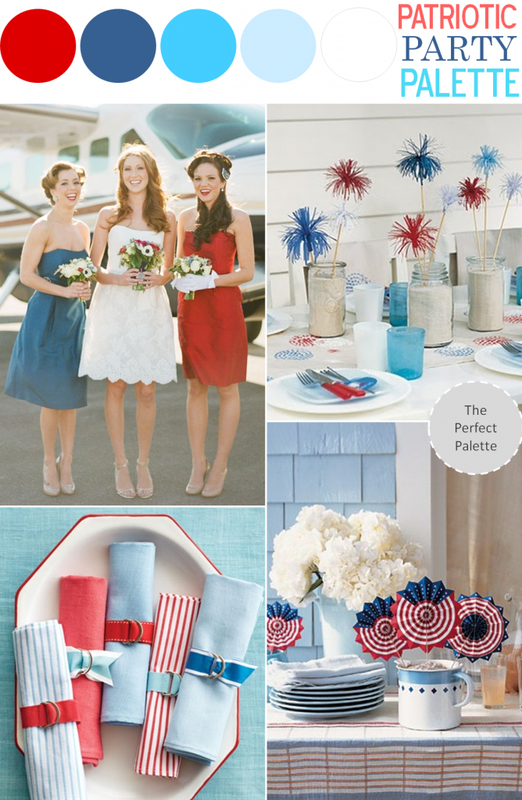 Patriotic Party Palette | Red, White + Blue! To all my American readers - Happy 4th of July! Just popping in to share a little patriotic pretty with you all! Because nothing says patriotic quite like stars, stripes, and a beautiful palette of red, white and blue! I'm absolutely loving these table displays! It just goes to show what a little pop of color can do for your tables! Am I right? Oh, and who isn't loving these sweet and creative napkins? Festive and oh-so colorful, these patriotic party ideas really did have me at hello! So tell me... what do you have planned this 4th of July? Fireworks, perhaps? A cookout with friends and family? That's exactly what I'll be doing! Here's to a fabulous 4th! Be safe and enjoy all of that red, white and blue! 12 Comments " Patriotic Party Palette | Red, White + Blue! " Love it! Loving the many Red, Blue and White Boards today! it looks so festive!!! love it! Love the bridesmaids - they're adorable! Such a fun and festive board. Hope you have a happy & safe 4th! I must admit I sometimes stay away from these colors fearing I will look like flag... but your composition is lovely and done with class. Happy 4th! This is so fun and festive! i just saw a weeding today on my IG feed! A Happy 4th! Loving these inspirations!